Railpictures.ca - Stephen C. Host Photo: Another of ‘my’ Oldies again. July, the time of year of high weeds. In 2018 the weeds are really bad – higher than our country’s infatuation with.. weed. Avoid. So this is an oldie? Well, it’s only been 14 years, but let’s see what’s different: The CSX engines are off the roster, Guelph Station does NOT look like this anymore as Metrolinx has added their ‘improvements’, and where I’m standing there’s a fence or a Steam locomotive in the way. For the un-initiated (read: kids born after 2000) when the EMD London plant was really busy with new products, they tended to test new units on the Guelph sub with help of local railways, and GEXR was a very willing participant. Pairs of CSX units, sometimes with GEXR assist power, sometimes without would test some days, and on others, just regular GEXR power. They even tested one or two BNSF units and a pair of UP units (the UP’s only ran at night.. ONCE!) Who remembers GEXR’s Police/Security they briefly had to help stop vandalism on these locomotives in Stratford and the police cruiser? Didn’t last long.. and the guy had quite the reputation for being a ‘bull’ with no authority. Train is eastbound 432 – which ran around Lunchtime – if you were lucky a light power 432 could roll by around 10-11 AM in better light, but westbound was much betterand I was there to capture the westbound run that day. | Railpictures.ca – Canadian Railway Photography – photographie ferroviaire Canadienne. Caption: Another of 'my' Oldies again. July, the time of year of high weeds. In 2018 the weeds are really bad - higher than our country's infatuation with.. weed. Avoid. So this is an oldie? 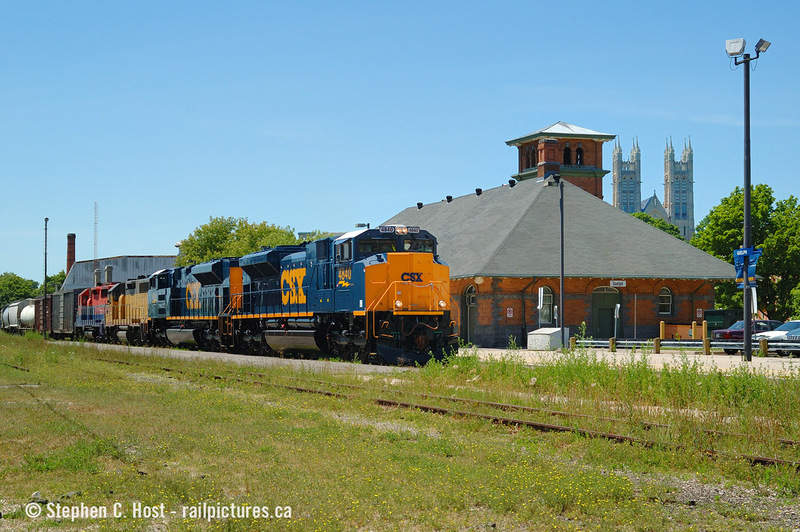 Well, it's only been 14 years, but let's see what's different: The CSX engines are off the roster, Guelph Station does NOT look like this anymore as Metrolinx has added their 'improvements', and where I'm standing there's a fence or a Steam locomotive in the way. Also Both GEXR units in this photo are off the roster - LLPX 2210 was blown up and sent away for repair never to come back, and RLK 2210 re-numbered 2211 to avoid confusion - is out of service. Could it return? For the un-initiated (read: kids born after 2000) when the EMD London plant was really busy with new products, they tended to test new units on the Guelph sub with help of local railways, and GEXR was a very willing participant.This was the first run of the CSX locomotives and interest was VERY high from local 'fans. Pairs of CSX units, sometimes with GEXR assist power, sometimes without would test some days, and on others, just regular GEXR power. They even tested one or two BNSF units and a pair of UP units (the UP's only ran at night.. ONCE!) Who remembers GEXR's Police/Security they briefly had to help stop vandalism on these locomotives in Stratford and the police cruiser? Didn't last long.. and the guy had quite the reputation for being a 'bull'. Train is eastbound 432 - which ran around Lunchtime - if you were lucky a light power 432 could roll by around 10-11 AM in better light, but westbound was much better and I was there to capture the westbound run that day. Nice! Glad I got a few of these runs. Hard to believe CSX already dumped these units. What a marvellous image. Yeah, I remember it like this, open and clean compared to most places today. We may be deforesting too much of Canada, but we sure as heck are not deweeding it. :o) Beautiful scene, this. But 14 years already? Yikes!!!! Love it! It’s interesting that in 2004 these were brand new, and in 2018, leasers. I think some have even slipped there way onto CN in the area a few times? But to have these leading, sometimes as sole power on GEXR, and brand-new, is priceless. Great that you captured the landmarks in the photo as well. And on GEXR, we’ve seen BNSF, UP and Southern Pacific (now the 3054) in full original paint! I didn’t capture the CSX units very well unfortunately as I was just getting into more intensive rail photography at this time (2004) but I did get a cool shot of the BNSF SD70ACe with GEXR 4019 back in, yes, 2006!